Cocoa is my favorite drink. I use to drink it everyday like coffee, but then I was hit with a bout of emergency room kidney stones and at some point, I was told chocolate could have been a contributor to that. Is that true? Anyways, I slowed my cocoa drinking down, but many ultrasounds later, I discovered I still had a stone in my right kidney. It seemed quitting cocoa drinking didn't really help much. I then decided I was just going to keep drinking cocoa when I felt like it. I needed to live a little. I started drinking cocoa again this last winter when it got uncharacteristically cold in Southern, California. Now it's spring and the weather is still not warm enough for me (I only fully function at approximate 85 degrees but it's been in the 70s mostly) so I am STILL drinking hot cocoa. I heat up some milk; add some honey and one tablespoon of Hershey's Cocoa. "100% Cacao" is what it says on the container. "What is Cacao exactly?" and "Is that good for me?" I Googled. Turns out it does have health benefits! Cacao comes from a tree. A cacao tree spouts these large oval-shaped pods (very space alien-like) and inside the pods are cacao beans. These beans are ground up and components of that create cocoa powder. But, here's the really good part. As I was googling, I was completely taken back, when very nonchalantly on the Internet; the history of the cacao plant involves ancient aliens! YES, many, many years ago in Mesoamerica, specifically what is Mexico today, there was a group of people known as the Toltecs (or Olmecs, the dates are never precise). 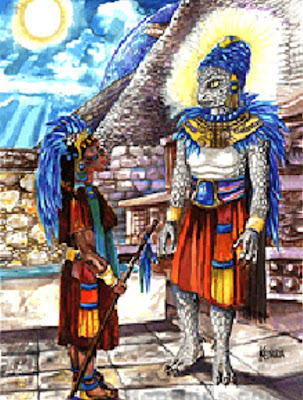 They were going about life as best they could when all of a sudden a flash of light comes from the Sun, floats down to Earth and out pops Quetzalcoatl. In other words, he landed his spaceship on Earth. 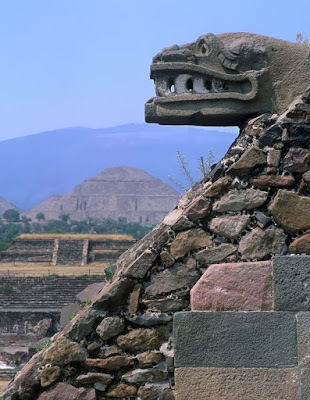 Quetzalcoatl was described as looking like a serpent but also with some colorful feathers like a parrot and that was how he was given his name, which literally means, "feathered serpent" in the Nahuatl or Aztec language. He must have looked like a very colorful reptilian. Even though the people were frightened at first, they soon discovered that Quetzalcoatl had come to help them. He had great knowledge and supernatural powers. He taught them many things including the arts and nutrition! The people did so well in learning from Quetzalcoatl that he decided to treat them with his favorite drink from his home planet of Venus. Arrangements were made and Quetzalcoatl planted the first cacao trees on Earth. He taught the people how to make the cocoa drink. This rich history was documented by the Toltec people and many years after, was taught and worshiped by the Aztecs and the Mayans. These cultures also got to enjoy the drink of the Gods. When the Spaniards came to Mesoamerica they were introduced to cocoa and the amazing cacao tree. The Spaniards decided to add cocoa to milk with honey and this is the recipe I drink today! They took the treat back to Europe and it was a hit. I'm embarrassed to admit I had no idea that cocoa originated in the jungles of Mexico. I thought it was from Europe because it's so popular there. Germany, Spain and France go crazy with chocolate delicacies. But, it's from Mexico. No wonder I'm hooked on it. My DNA has 19% Native American, Northern Michoacán from my Grandfather. Michoacán is located only 4 hours from Tula de Allende where the Toltecs lived. It is literally engraved in my DNA to drink cocoa; a gift from the gods. Raise your mug and cheers to Quetzalcoatl! Please give credit if you know the artist and I will update. 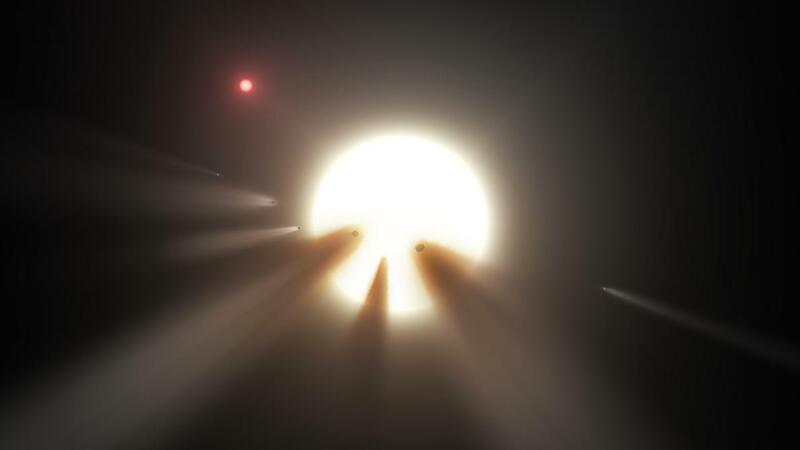 This has got to be one of the most intriguing alien encounter stories I've heard yet. One morning way back in April of 1961, in Eagle River Wisconson, resident, Joe Simonton, saw a bright silvery UFO come straight down and hover over his lawn. He claims a hatch on the UFO opened and out popped a little alien man gesturing in a way that Mr. Simonton believed was a request for water as the alien held out a jug with this gesture. Simonton took the jug, filled it with water and gave it back to the alien. He then saw another alien aboard the ship, frying on some sort of grill! 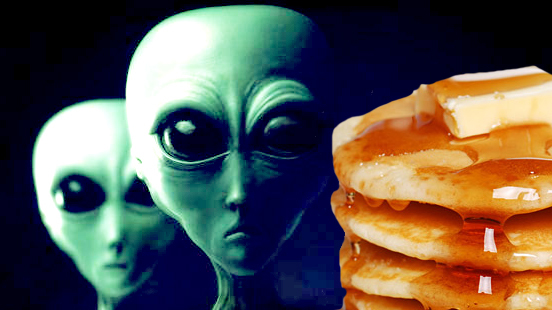 When Simonton pointed at the grill hoping to start a dialog, the aliens still did not speak, but handed him one of the, what appeared to be pancakes! To which Simonton shows to the cameras in the video below. After this, the alien got back inside the ship, closed up the hatches and the UFO hovered straight up about 20 feet, tilted at a 45-degree angle and shot off out of sight within 2 seconds. The whole incident lasted about 5 minutes. Simonton turned the pancakes over to the Airforce, who then had the American FDA analyze them. The pancakes turned out to be 100% pure buckwheat pancakes. I totally believe this story. If anything, it makes more Earthly sense then other alien and UFO encounters. Just like those times that you have to stop by a convenience store to pick up a few things for the road, these aliens did the same only instead of a convenience store, it was Joe Simonton's house. Hello! Last Saturday, June 16th, I attended AlienCon held at the Pasadena Convention Center here in Southern California. It was the first Alien themed convention to be held in Los Angeles so I was very excited. Finally! L.A. gets an alien-themed convention. I had been waiting for this as they seem to have conventions for everything else! It was a great turn-out. In my opinion, they might need a bigger venue next year. I only attended on Saturday even though the convention went for three days starting on Friday and ending on Sunday. Durning the time I spent there, the crowd seemed friendly and supportive of one another, sharing their love for everything extraterrestrial. Strangers were even trying to help each other find out what lines they should be standing in. The lines were a bit confusing. They weren't that long compared to other conventions I've been to and moved fairly quickly, but there were no signs indicating which lines were for what and who. Some people were waiting in line for autographs, some waiting to get into panels and others waiting for photograph ops with their favorite celebrities. The lines were a little mixed up and some of the staff, when asked "What line is this for?" actually gave incorrect information. Some people found themselves waiting in a general line for nothing! A con-goers worst nightmare. Since I did not purchase any autograph sessions or photo sessions with anyone, (yes, the autographs and photo sessions cost money ranging from $10 to David Duchovny who was $100!) I got into the first line I saw that was headed into a building for a panel. With my luck, it happened to be a panel with Linda Moulton Howe about Alien Abductions! Perfect. I was pleasantly surprised though, the talk ended up centering around the metaphysical and how it can relate to extraterrestrials. Towards the end of the panel, audience members were invited to go up to a microphone and tell their stories or ask questions. I was most intrigued by the audience's experiences. 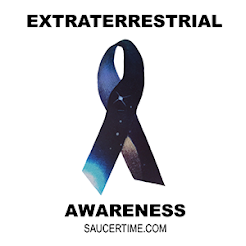 As some of what they described were similar to my own in terms of seeing UFOs, glowing orbs or floating lights until a man went up to the microphone to mention he had been abducted strictly to have sexual relations with aliens and then the panel came to a polite, but an abrupt end. "Ok, thank you, everyone! That's all the time we have right now!" said the panel. The other panel I attended was for Ancient Aliens with speakers, author, Erich von Daniken and TV personality and publisher, Giorgio Tsoukalos. It was a more mainstream event held in the concert hall. The whole place was filled! There were even people standing without seats. All these people wanted to know more about aliens. It definitely felt like I was seeing the very beginning of a consciousness revolution. Von Daniken is a wonderfully engaging speaker. He talked about how he was inspired to write his books and in some ways, it felt like I was attending a religious gathering as he spoke about God and beings coming down to help humans on Earth, but all with a positive and inspiring undertone. 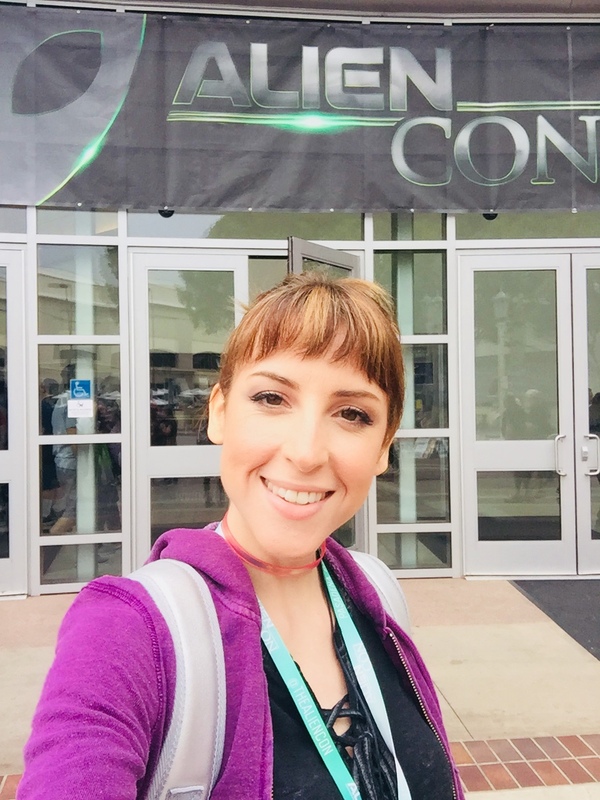 The last thing I did was walk the convention grounds in the main hall. I thought there would be more booths advertising things or selling books. There were very few booths. Some people were selling their independent publications, some advertising psychic readings and holistic health and some people were selling hippie-like accessories, rocks and shaman sticks. I enjoyed looking at everything, but hopefully, for the next convention, the con gets more vendors. I was thinking maybe it just wasn't advertised enough to gather a wider variety of professional vendors. I did appreciate the original art that was being sold by artists. It definitely wasn't the type of pop culture art you come across every day. Being that the subject matter was alien and sci-fi themed, the pieces were highly creative. 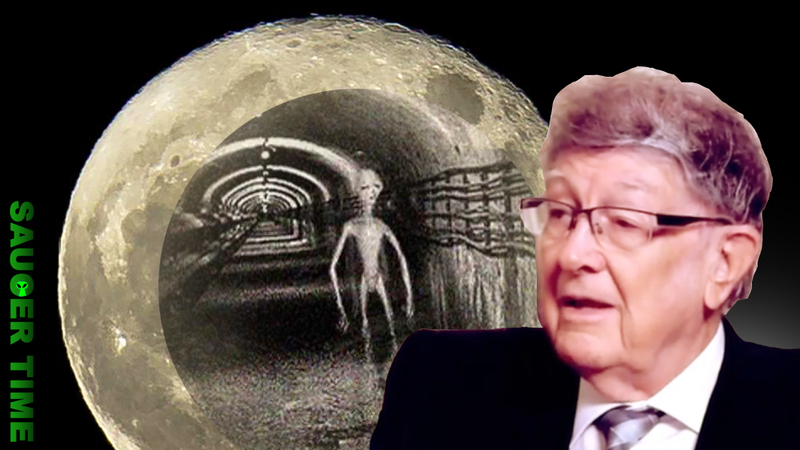 Is The Moon An Alien Base Facility? The late William Tompkins aka Bill Tompkins had a successful career as an aerospace engineer for the US Navy. Before he passed away last year, he was a frequent speaker at MUFON symposiums and gave whistleblowing interviews. Some of these interviews can be found on Youtube. In one interview, Tompkins points out the fact that the Moon's month-long rotation syncs with the Earth's one-day rotation keeping one side of the Moon always facing Earth. His explanation for this is because the Moon is not a random piece of rock stuck orbiting around the Earth, but is actually, in fact, a hollow structure that was strategically placed there by extraterrestrials using it as a base facility. Possibly as a base to closely observe Earth. If this is true, it would definitely explain why UFOs have been spotted flying in and out of the Moon. Tompkins also mentioned that this is why NASA only made a small number of trips to the Moon and never further explored the possibility of our own Moonbase on the Moon. Apparently, the E.T.s prohibited it! Other fascinating stories told by Tompkins are ones about what a WWII Navy operative spy discovered when they infiltrated a secret, underground, Nazi construction laboratory. These Nazi laboratories were filled with hundreds of "wingless" vehicles being constructed using slave labor. The vehicles were also accompanied by 7 different sizes and classes of weapons that reportedly no one had ever seen before due to their laser abilities. The blueprints for these vehicles and weapons were acquired by the Nazi's via Draco Reptilians. This information possibly connects with the Vril Society in Germany and their ability to channel extraterrestrials who had once lived in what is now Sumeria. There is more to the story, but it sounds like a blockbuster sci-fi film. I have a book I need to read titled, Dark Star, that talks about the UFOs the Nazi's were trying to reproduce- but did they really try to team up with Reptilians?! These stories sound very skeptical, but remember, Tompkins was only relaying the stories he was told by another source. It could have been a game of Telephone. Maybe the gist of these stories are true, but details are far-fetched. I kept trying to find more information on Bill Tompkins' personal life. Was their anyone out there who could help him back up his stories? I found this video of Dr. Robert Wood delivering Tompkin's eulogy last summer. Dr. Wood worked with Tompkin's on his book, Selected by Extraterrestrials, and it seems as though Dr. Wood knew him well and spoke as if nothing Tompkins ever said was out of character. It's also noted that Tompkins passed away on August 21, 2017, at the age of 94, the same day of the solar eclipse. Some people think that his passing coinciding with an astrological event was not a coincidence.